Also opening on November 17, 2012 and running through Sunday, March 17, 2013 is sculptor Soo Sunny Park’s large-scale installation SSVT (South Stafford, Vermont) Vapor Slide (2007). 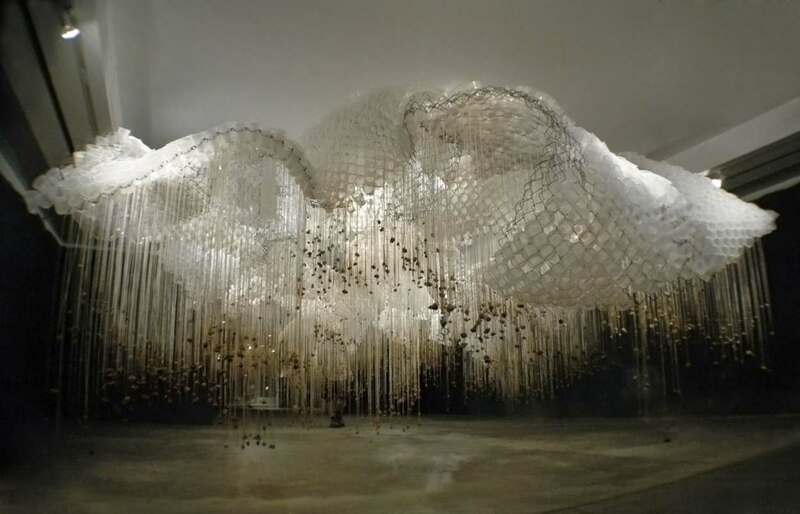 The exhibit combines quotidian materials – chain link fence, plastic cups, paper clips, river rocks – in imaginative ways, crafting a dazzling environment of ethereal light and space. Park, a 2000 alumna of Cranbrook Academy of Art’s Sculpture Department, created the work in response to the undulating, snowy hills of South Strafford, Vermont. The installation uses chain link fence, a conventional boundary demarcation, to fashion a space through which viewers move rather than as a method of impeding access. In doing so, SSVT (South Strafford, Vermont) Vapor Slide becomes a spellbinding meditation on the interstitial spaces we encounter every day and the myriad possibilities hidden within. Born in Seoul, South Korea, Soo Sunny Park moved to the United States of the age of eleven and grew up in Georgia and Florida. Before studying at Cranbrook, she received her BFA from the Columbus College of Art and Design in Ohio. She currently is a Professor of Studio Art at Dartmouth College and is preparing for a retrospective that will open at Rice University in Texas in April 2013, immediately after her installation closes at Cranbrook.